In the previous installment of this series, Jason, son of Jupiter (or Zeus), wakes up and remembers nothing about his old life. He learns about Greek mythology and hears a prophecy at Camp Half Blood, a camp for Greek half bloods (half gods, half humans). 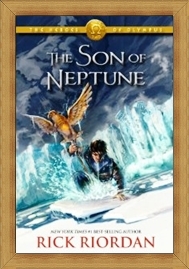 In this book, while Jason is a Camp Half Blood, Percy Jackson, the Son of Neptune, also loses his memory and finds himself in a Roman camp. He and some new friends go on a quest and learn that Greeks and Romans must work together to defeat the most powerful goddess of all: Gea the goddess of the earth. Even though all these series by Rick Riordan are a little repetitive, I couldn't stop reading it. It was a fun, easy read.